Preformatted text keeps your spaces, tabs and line-breaks as they are. The preformatted block is very similar to the code block, with a few small differences. Preformatted blocks keep all spaces & line-breaks intact, and display text exactly as you type it. However, they don't use the HTML <code> element, and come with a few more styling options. Your preformatted block will be styled by your theme, and will typically be displayed in a monospace font. To apply these styles to your preformatted text, simply click the B for bold, the I for italics, and the ABC for strikethrough. Unlike code blocks, with preformatted blocks, you can add hyperlinks to your text. 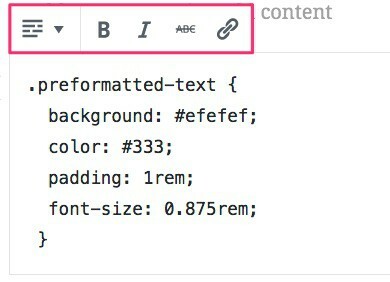 Preformatted text can only be turned back into a paragraph, which will remove any styles applied by your theme, and display your text in the same way as your main article content.